If you were a bit confused at Azusa’s council meeting last night when the council, already having voted on a going with a special election for the Azusa Rock Quarry referendum, decided to vote again, I can clear that up. During the break after the initial vote, I asked Mayor Joe Rocha why he had voted no on the original motion. Was it because he disagreed with the date? The special election versus the March municipal election date? DId he prefer voting to rescind the development agreement as a council? None of the above. Rocha was surprised at the question and realized he made a mistake. He then asked they could re-vote so he could be on record as voting in favor of the referendum’s special election. In the end, it was unanimous. Mole hill or (cash) mountain? How serious is the news of Monterey Park executives cashing out $100,000s in leave time? Is vacation time accrued the same as money earned? That may be the question of the hour after we learned that Monterey Park’s former City Manager and Police Chief each pocketed hundreds of thousands of dollars in saved leave time when each left their positions. Most recently, it was former City Manager and current Glendora top executive Chris Jeffers who took nearly half a million in saved leave time before leaving Monterey Park in 2007. 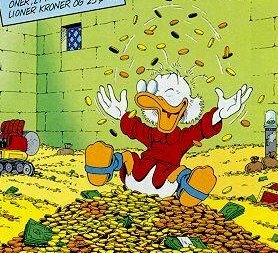 Some have argued (via the comments section) that this is a mole hill being made into a mountain (a Scrooge McDuck mountain of coin, am I right?!). There is merit to the argument that if a person doesn’t take their vacation time, they should be allowed to cash it in. They didn’t use it, instead worked and are entitled to the value of that benefit. But those arguing that in this circumstance may be missing a vital point: Are city executives being given an exceeding large amount of leave time? And is that benefit a backhanded way of giving them additional pay when they are given more leave time then they will ever use? Racking up a day of vacation each week of employment, as Jeffers was doing in his final year at Monterey Park, and having executives able to earn three months of time off a year seems excessive. Should city department directors, working on the public’s dime, be allowed to take three months off in a year? If the answer is no (as I assume most citizens would agree) then why give them the opportunity? Finally, Jeffers’ current employer didn’t do themselves any favors in the story about their city manager’s former job. Two council members didn’t know what Jeffers’ pay was when asked. Mayor Ken Herman seemed to be defending Jeffers’ actions in Monterey Park. Councilman Terry Kent, in an e-mail to this newspaper, was upset at the way he was portrayed in the paper. Kent was at a wedding out of state and felt that should have been included in the story when describing why he couldn’t recite Jeffers’ salary. The real question for the council is this: With this knowledge, what will they do? The council, in the past, has stood by their city manager and often follow his suggestions. But will this force them to examine their city executive contracts for leave time? Or will they follow what Herman seemed to imply in the story that these benefits packages are comparable to other cities and Glendora must offer them to remain competitive in hiring top talent? Does “because everybody else is doing it” make it right? Or does that mean there is a widespread problem? Answering that is best left to voters. Came across this blog on the Jacksonville Jaguars website that talks about how the team has had to work to sell tickets for this week’s Monday Night Football game against the Tennessee Titans. For most teams, MNF would be enough to get an easy sell out, but not in Jacksonville where the team had to blackout many games last year after not selling enough tickets for home games. The Jaguars have been a team discussed as a potential suitor to move to Los Angeles if Ed Roski and his Industry stadium team are able to lure someone out west. After AEG’s Tim Leiweke spoke to L.A. business folk Tuesday about using the L.A. Convention Center to help build an NFL stadium, some people aren’t reacting to it as he might hope. The big hiccup? Ed Roski’s Industry stadium is privately financed while Leiweke is asking for, oh, something like $1 billion from taxpayers. L.A. Observed has a video up. And you can put Ron Kaye on the side of Roski’s plan vs. Leiweke’s downtown idea. Irwindale is drafting a new Environmental Impact Report for a material recovery facility planned for a site on the city’s border, but Baldwin Park officials are adamantly opposed to the project, they said. A draft EIR for the project was completed in 2009, but a consultant hired by Baldwin Park to review the document said the report was inadequate and should be rewritten and redistributed. Trash hauler Athens Services would use the 17-acre site at Live Oak Avenue and Arrow Highway in Irwindale to sort recyclables from garbage before sending the remaining trash to a landfill. Baldwin Park officials are concerned about the environmental implications, including air quality issues, that the facility may present for its residents. Bernudiz was unsure about when the EIR would be completed, he said. While researching this story comparing a referendum in Azusa of Vulcan Materials Co.’s new amended mining plan versus Rosemead residents earlier failed attempt to stop a Wal-Mart in the city, there were some other interesting parallels that I stumbled across. Community groups filed lawsuits against the Wal-Mart projects’ environmental impact report for being incomplete, much like Duarte’s lawsuit against the Azusa Rock Quarry plan’s EIR, claiming it is insufficient. A judge agreed that Wal-mart’s EIR was incomplete, but the ruling only stalled the project. What I found most interesting was the Rosemead council came under fire for having an emergency vote to grant Wal-Mart a certificate of occupancy, something opponents said violated the Ralph M. Brown Act’s open meeting laws. Azusa is facing similar claims after an urgency vote to reconsider the mining plan. The council had originally voted against it, but later voted to bring it back for a second vote at a council meeting without putting the item on the agenda. Duarte’s lawsuit includes alleging Azusa violated the Brown Act. In Rosemead, the Los Angeles County District Attorney’s Office faulted the council, but did not demand corrective action because the Wal-Mart was already built and open. Will Azusa’s council face the same fate? And, if so, what are the potential implications? Before we get into week-in-review, I want to take this time to put Chargers’ fans on blast. I am not a Raiders fan by any means, nor am I am Charger’s hater. In fact, nine times out of ten, I root for the Bolts over those norther demons. But this weekend all I heard from Chargers’ fans was disrespect and comments about how Sunday’s game was nothing more than a practice game. I can’t say how happy it makes me when someone talks trash, takes a team lightly, and makes ludacris claims only to have them get beat. Best thing that happens in sports. You know that movie ‘Little Giants‘? Underdogs win sometimes, that is why they even have the word underdog. Let that be a lesson to those San Diegans who thought they had a stats padding day set up for them. Here is the weekend news you missed, but should know about. In Azusa, the potential affects of a Azusa Rock Quarry mining referendum are still being debated. Two attorney’s involved in a Rosemead Wal-Mart referendum (one for and one against) take a look at the implications in Azusa. After she filed a lawsuit against Councilman Roger Hernandez, people working for in West Covina claim public information officer Sue Williams is rarely at work. In Diamond Bar, officials let go of a building officials who previously worked as a planning director in Bell. When was the last time you heard about a business getting arrested for turning a profit? Today, that’s when. Apparently, medical marijuana sellers aren’t the small business backbone (I think a better small business metaphor is to say they are more like nerve endings or knee caps. Yeah, knee caps) of America. Dispensaries are non-profit businesses, as outlined by state law. So when a few of them allegedly starting bringing in extra proceeds, the police decided it was time for a raid. If that is the case, enough said. They broke the law and that’s that, right? The owners and partners with the dispensaries deny police claims, but that will play out in court. But this begs the larger question, with something as potentially profitable as marijuana and the ongoing issues with dispensaries – including the popularity of opening them – to avoid these problems, why not just have this administered by the state or hospitals to avoid issues of free market business meddling with the law? Is this a viable option? Maybe I’m crazy, and if I am, I’ll be happy to hear why. In other news, no arrests have been made against the charitable “non-profit” organizations that offer 400,000 plus salaries for its executives.